It's no secret that I am a cookbook junkie. I own (and keep buying) a sickening number of cookbooks (and to think I almost never follow a recipe exactly). I own a lot of cookbooks that I love, but I actually only use a handful of recipes from. But every once in a while, I find a cookbook that I can cook inside-and-out... Ottolenghi's Plenty, Heidi Swanson's Super Natural Every Day, David Lebovitz's My Paris Kitchen, Mollie Katzen's The New Moosewood Cookbook, to name a few. Well, I now have another to add to that list! 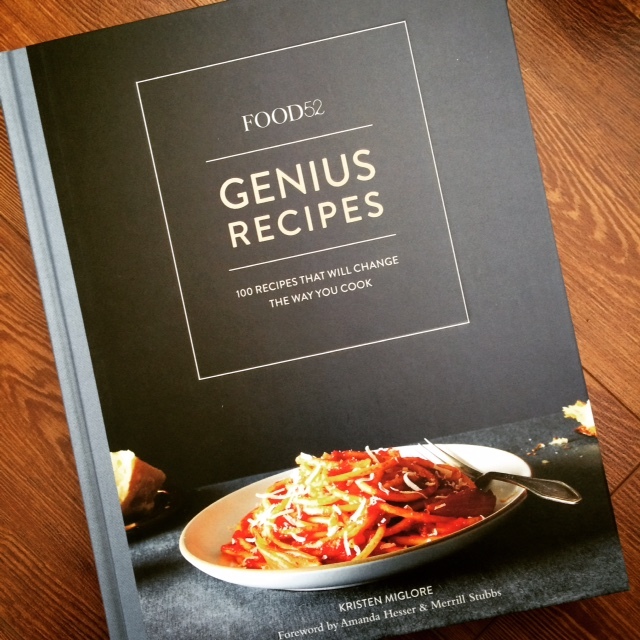 I received my pre-ordered copy of Genius Recipes in the mail this morning (finally! Mail takes for-EVER to arrive in the far north). During Noah's nap I started to leaf through it excitedly... and I could NOT put it down! I read the entire thing cover to cover in one sitting. No joke. I had to stop dog-earing the pages because I literally want to try every single recipe in this book. If you haven't heard about this book, it comes from the very popular food blog, Food52. It's essentially a "greatest hits" cookbook, and it includes some of the best recipes from some of the best chefs in the world today. "There isn't yet a single cookbook where you can find Marcella Hazan's tomato sauce with onion and butter, Jim Lahey's no-knead bread, and Nigella Lawson's dense chocolate loaf cake - plus dozens more of the most talked about, just-crazy-enough-to-work recipes of our time. Until now." The book contains so many of my already favourite recipes, which I discovered around the web over the years (but I never knew their true origins). I love how each recipe is preceded by a little preamble explaining why the recipe is so genius, where it came from, and why it works. I have already learned so many cool tricks from this book just from the first read. This book is an instant favourite! Loved the quotation that you have used to motivate me towards buying the book. I really needed the book as I had your recipes written all over some scattered papers.